Susana Lein has flown home to Salamander Springs Farm in Berea, KY and I am left with a moment to contemplate her visit and the permaculture workshop she presented at Heathcote Botanical Gardens. I expected the Workshop to fill, and it did, and I expected the class to be interesting. It was fascinating and fun. I had hoped that we who attended the workshop would have time to meet one another and to form a new network of active permaculture links. We did get to spend some time learning about each other, and I think the potential for creating a new permaculture network is good. The dynamic nature of this group was really exciting for me. I saw some familiar faces, and I met some new friends, but the way we fit together as a group was so interesting. We are diverse in all of the ways that members of a community are, and yet there was a tangible sense of agreement among us too that made me feel that we shared a commonality. 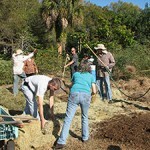 When it was time for the practical portion of the workshop, we changed a 20’x 25′ grassy patch into a new sheet compost, or layer cake garden in less than an hour. I do this sort of work regularly. Sometimes I have made large gardens by my lone or with the help of my husband, and sometimes with the help of a few friends or volunteers. It always takes some time. 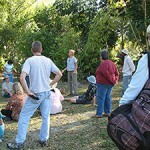 The huge amount of work the permaculture workshoppers got done in an hour was exciting. It wasn’t that we were very well organized, we weren’t, but the work was there in front of us, the materials were there ahead of time (thanks to some gathering of manure and hay donations done in the weeks ahead of the workshop), and we all knew what we had to accomplish, and our many hands made a big job seem small. 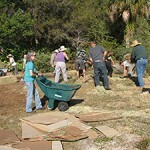 It was a powerful example of the collective force in banding together to share a chore. There was another outcome from having shared work together that just sharing a classroom may not have produced. 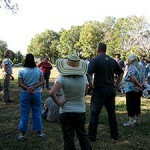 After the work was done and we all sat down on the grass in the shade together we were different than before. It seemed to me that in expending our energy together and completing a chore we had become more familiar. I have sensed this each week when several of us garden volunteers complete a harvest, having picked, packed, weighed and delivered the harvest together makes us more cohesive. 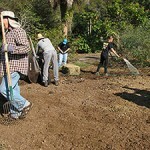 This is a connection to community, a benefit, that I think we lost when we mechanized our work. After the classroom portion of the workshop lunch was served. Many of the people attending the workshop opted to buy the prepared lunch from S&S Takeout in Fort Pierce. It was a really good vege sandwich made with thin sliced breaded and fried eggplant with roasted red peppers, provolone cheese and a balsamic drizzle on a ciabatta roll. There was also a whole wheat pasta salad and cookies, and we drank Roselle tea. 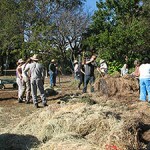 We couldn’t have completed the practical application of the workshop with out manure and hay donations. 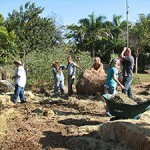 We were given 6 bales of moldy T&A Hay from Rosa at Thomas Feed and Farm Supply on Okeechobee Rd. 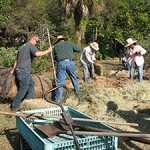 in Fort Pierce, and we received an old round bale and all the loose coastal hay we could rake out of the trailer from Ronnie at Tri-County Feed on US I in South Fort Pierce. Our manure donations came from Thea Bullard at Midnight Cattle Company, Wyn Burns at Creature Safe Place, and Miss Pam from Granny Pam’s Pony Rides. We are also grateful to Heathcote Botanical Gardens for jumping at the opportunity to host this workshop, helping to publisize it, and for their help with setting up the Pioneer House with tables and chairs for us. Finally I want to mention again that we had many hands working ahead of and during the workshop to make sure we were well prepared. James collected cardboard and filled his truck twice with manure as well as joining me to collect manure a third time. Renee and Mike worked on the cardboard, removing staples and tape from a mountain of giant boxes. Susana went out on pasture with me to collect our last load of manure, and then Nan, Renee, and James covered all of our various needs throughout the workshop. When we broke for lunch Renee and Nan made sure the food was there. Nan put tables and chairs out on the patio so that we could all sit together. She made the Roselle tea and other refreshments, and took care of all issues kitchen, and even managed to shoot some pretty good pics. 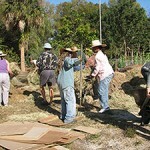 Of course without Susana Lein and her permaculture training program none of this would have been possible. She has had a profound effect on me, and I remain grateful for having met her and for each of her classes that I have been able to attend. She has greatly increased my understanding of permaculture principles and practices, and she has done this with great patience, and without judgement. Fascinating!! Thanks, as always, for educating us! !